Product #21110 | SKU MS50G | 0.0 (no ratings yet) Thanks for your rating! 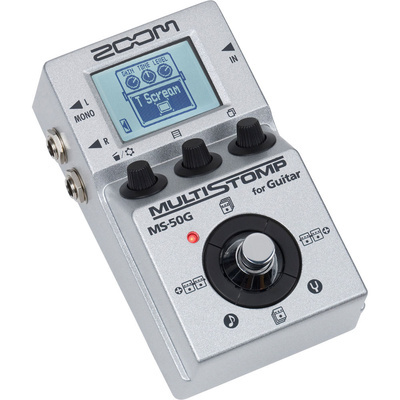 Designed to provide a multitude of guitar tones and axe-effects at the tap of your toe, the MS-50G MultiStomp Guitar Pedal from Zoom is a stompbox sporting distortion, modulation effects, dynamics processing, amp emulation, delay, chorus, reverb, and more. This pedal allows you to combine any six effects in any order. To store your custom-tailored effects, there are 50 on-board patch-memory slots. Furthermore, an Auto Save function will make sure that any edit you make to any preset you'Voe created will, as the name suggests, be saved automatically. You can cycle through 26 patches in any order you choose, thus satisfying your inevitable wish—if you'Voe ever interfaced with a giant pedal board—to simply single-stomp your way through an entire set-list. A single 1/4" input handles both active and passive instruments, though the device sports dual output jacks to facilitate true stereo, either live or in recording. An on-board chromatic tuner and tap-tempo feature are also provided. Delays and Reverbs: A 32-bit floating-point microchip enables 10 naturalistic reverbs and delays, including reverse, modulated, and self-oscillating.